The Green Bike Program is a student-run organization created to promote cycling, bike safety and sustainability at The Claremont Colleges and the surrounding community. This is done through the reuse of old bikes and parts along with the organization of cycling events. The Green Bike Program gives community members free access to bicycles, tools, repair lessons. 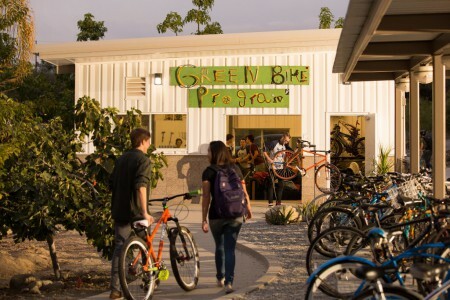 Founded by Pitzer College students in 2001, the Green Bike Program (GBP) provides Pitzer students with free loaner bikes, encouraging eco-friendly transportation around The Claremont Colleges. The GBP was crafted by Pitzer students Joey Haber, Gus Porter, and Fritz Rice, with support from Pitzer Professor Al Wachtel and former Associate Dean of Student Affairs Chris Freeberg, with funding from Pitzer’s EcoCenter. The GBP began as an attempt to counter Los Angeles’ renowned car culture by encouraging people to use bikes, and by facilitating their accessibility for Pitzer students and their maintenance for the whole of The Claremont College Consortium. At the end of each semester, Campus Safety confiscates abandoned bikes left on racks around campus. Usually, these bikes end up in a landfill; but thanks to the GBP, these bikes are refurbished and raffled off each semester at no charge. All students, staff and faculty from the 5Cs – not just GBP bike recipients – can bring their bikes to the shop for repairs. Lend out bicycles (for the semester) for people that volunteer at the shop for 4 hours. You did not need to know a thing about bikes to volunteer at the shop. If you are interested in volunteering, stop by the shop during open hours. Sell and install new tubes, tires, cables, and handlebar grips. Employ non-work study students, but you’re always welcome to come and volunteer in the shop. Time spent with the GBP can be counted towards your Social Responsiblity Requirement for graduation. Stop by to check out our costs for repair parts. All labor is provided free of charge. If you are in an art class, stop by! The Green Bike Shop routinely gives unusable parts (including everything from wheels, frames and pedals to nuts, bolts, and washers) to art students from all 5C’s to use in artistic pieces. Ask about the art parts box. If you have already made a piece or plan to make one out of parts from the Green Bike Shop, kindly send us a digital picture of the work, if possible, to add even more chillness to the shop.